On March 1, Starwood rolled out their new SPG Benefits, one of which is 10 suite night awards for SPG Platinum members who hit the 50-night mark per calendar year. You can use these suite night awards to confirm certain suites and premium rooms beginning 5 nights prior to arrival, subject to availability. 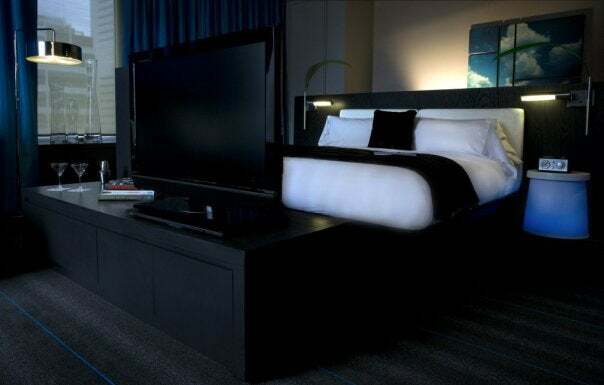 This is intended to be an upgrade to a suite, but some hotels won’t be able to fulfill it due to capacity, so there will be other options to choose from – including the most desirable oceanfront rooms at some resorts. Hotels have been encouraged to include premium suites as well. Members will have choice to select exact room they will be on the list for and will be able to see all options on SPG.com -> My Stays. There they can check the box for multiple rooms, and starting at 5 days before their stay SPG will automatically search to see if they can confirm the Platinum member in the most premium room and then going down. The great thing is that this whole process will be automatically done by Starwood so you don’t have to worry about showing up at the hotel and trying to argue your way into a suite at check-in. The automatic system will keep checking for availability up until 2pm the day before arrival and at that point if there’s no suite available, you get the upgrades back and try for an on-site upgrade like every other Platinum. 1. Log in to SPG.com and select ALL STAYS. This will pull up all of your upcoming reservations. First, select All Stays and find the one you want to upgrade. 2. Next, locate the reservation you want to try to upgrade by clicking “Apply Suite Night Awards to this stay.” Note that not all reservations will be eligible. Some may state: “We’re sorry, Suite Night Awards can’t be applied to this reservation.” This could be because of a non-eligible SPG rate, not enough Suite Night Awards left, trying to upgrade multiple rooms, or if a premium room or suite is already booked and there is no higher room category. 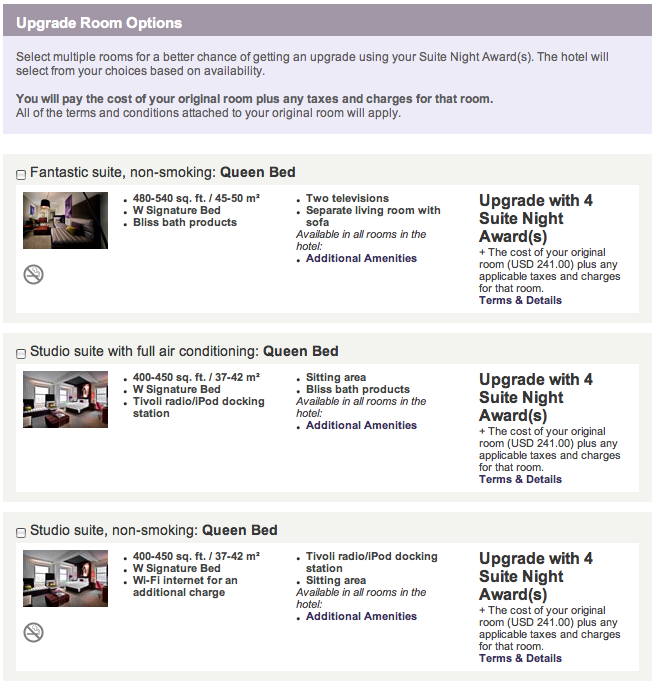 Next, find the stay you want to upgrade to see if it is eligible for upgrades. 3. The next screen will come up with your current room type as well as the Upgraded Room Options. This is where you can select multiple rooms you wish to be upgraded to. Remember when upgrades “clear” you will automatically be upgraded to the best suite or room that is available from what you select here. After checking the room types, select Submit Upgrade Request in the lower right corner. 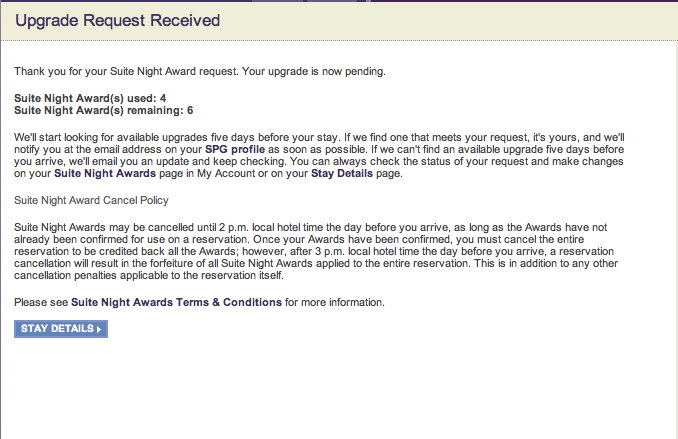 Your Suite Night Award upgrade request will be acknowledged. 4. You will receive a message that your upgrade request has been received and is pending as well as displaying how many suite upgrades you have used (including pending upgrades) and how many upgrades you still have left. SPG will also send an email confirming your suite upgrade request and will notify you by email should your upgrade clear starting 5 days prior to arrival. Starting five nights prior to arrival, you will be notified whether your upgrade has cleared … for instance to a Fantastic Suite at the W Montreal. When booking these suite night awards, see what suites are included to use your Suite Night Awards. Some hotels only offer junior suites or even just larger corner rooms which you could probably get at check-in anyway, so make sure the suites available for these are worth using it. However, some properties will offer much larger suites with a separate living room and multiple bathrooms. In order to check what suites are available for upgrades, you must have a reservation for the hotel and then make a mock “Apply Suite Awards” request to see what suites are available. It would be a nice feature if Starwood showed the rooms that you can apply a Suite Night Award to for each hotel without making an actual booking, but at least this works for reservations you have to make anyway, and you can do some educated guesswork by looking at properties before making a reservation. To get started, look at how many suites the hotel has total. The number of rooms and suites is usually listed on the hotel’s site, but if not you can always call and ask. For example, the Westin Diplomat in Hollywood, Florida has 898 rooms including 100 suites. This property is known for being extremely generous to Platinums (and my own experience confirms it), so this would be a property where I might just hold off and hope for an upgrade at check-in. Here is a great thread on Flyertalk as well that shows SPG Platinum members’ strategies and successes using confirmed suite upgrades. See what time of the year it is and how busy the hotel is. If you are booking the St. Regis Aspen during ski season, they can usually sell most of their suites, so that would be a good time to use these upgrades. However, if it is in summer then there would be a higher chance for a complimentary upgrade at check-in, so you wouldn’t have to burn one of your 10. Make a mock booking and see what room categories the hotel is selling 6 days out and if all the suites are still available then you might want to hold off and wait for an upgrade at check-in. If they are only selling one suite category, then you could go into your reservation and apply the suite upgrade award and try to get it. If there is a special occasion such as anniversary or birthday and you really want to confirm that suite before check-in then apply one of these suite upgrades. We want to hear where you have used your SPG Suite Nights or where you are planning to! It would be nice if more hotels included premium suites but some hotels are continuing to add and change suites to what they are allowing upgrades on. For example, the St. Regis Aspen used to only allow Junior Suites now it allows an upgrade to a full one-bedroom suite, so hopefully this elite benefit will continue to develop and get better. Just for comparison’s sake, let’s take a look at this new SPG benefit compared to its counterpart in Hyatt’s Gold Passport program. SPG Platinum members’ 10 suite night awards are only deducted for the number of nights stayed, meaning if you are only staying 1 night, they only take one award, and if you are staying 3 nights, you’d have to use 3 awards. The suites will only be confirmed within 5 nights of your arrival. With Hyatt, Hyatt Diamond members receive 4 suite upgrades and one is deducted whether the stay is for 1 night or a week and it can be confirmed at the time of booking. If your travel plans are normally short 1-2 night stays then SPG Suite Night Award program may be better than Hyatt’s since you could theoretically get 10 separate suite upgrades. However, if you plan weeklong stays, then Hyatt’s is better. Starwood’s new suite upgrade awards are in addition to their current upgrade policy of upgrading Platinum members to the best available room at check-in, which includes select standard suites. With that in mind, if you have some strategies in place you should be able to increase the number of nights you are staying in a suite with Starwood this year.